Sure it's creepy as hell and looks uncomfortable to use, but it's also steampunk and mighty cool-looking. To quote Peter Balch: "Every self-respecting Victorian Scientist needs a brain in a jar." That's hard logic to argue with, but brains in jars aren't easy to find these days. 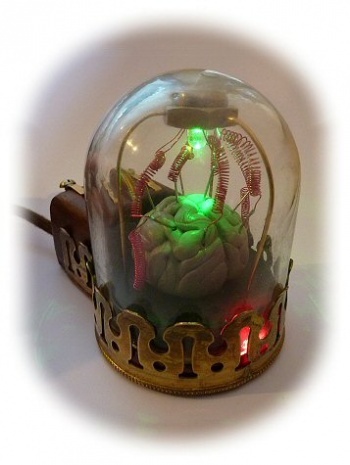 Thankfully, Balch, who is an independent technical programmer and hardware designer out of Scotland, is helping his fellow crazy inventors out and has come up with a brain in a jar that doubles as a computer mouse. â€¢ Start with a standard optical mouse with a fairly small footprint. â€¢ Take a photo of the pcb layout to trace the tracks if needed. â€¢ Remove the microswitches and the wheel encoder. â€¢ Blocks of wood are carved to enclose the wheel-encoder and button. â€¢ The pcb is cut down to size. Enamelled-wire is used to replace the lost tracks. â€¢ A thin ply baseplate is cut and the pcb and stripboard screwed onto it. Small wooden pads will support the dome. â€¢ The wood is stained. Gold plated bronze contacts (salvaged from scrap electronics) make the mouse buttons; there's not enough room in the wooden blocks to fit microswitches. â€¢ A shoelace covers the mouse cable to give it a Victorian look. â€¢ The dome is from a Victorian gas mantle. â€¢ The brass railing is from a fake oil lamp found in a car-boot sale. â€¢ The brain is made from Fimo wrapped around an egg-shaped piece of wood. The electrodes are enamelled copper wire and pins. The cage is brass wire, a nut, a screw-cup and a thumb-tack all soldered together. A colour-changing LED is glued inside the nut and connected in parallel with the optical-mouse's LED. â€¢ The dome and railing are glued into place and it's finished. Balch says that he's willing to make this, and full-scale models, for interested parties, but he doesn't mention a price point. Personally, I'd love a to get a mouse that's a bit more comfortable-looking, but you can't deny just how wicked this overall design is.